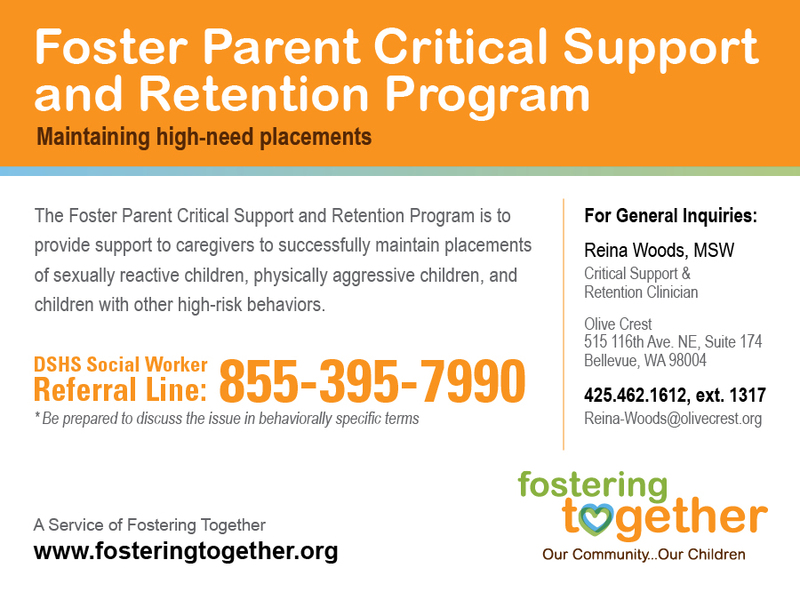 the Foster Parent Critical Support & Retention Program, a service of Fostering Together and a program of Olive Crest. This service targets foster parents who need assistance in managing the high-risk sexualized or physically aggressive behaviors of foster children in their home. The program goal is the increase foster parent’s subjective experience of support and to link foster parents more closely to natural supports in their communities. This goal will be operationalized through the provision of short-term (3-months) intensive clinical case management for children with mental and behavioral health issues and cognitive and educational interventions with foster parents and other adult care providers. This program rolled out in late 2012 and is accepting referrals. Please help us spread the word about this important resource to foster families who need help understanding and managing troublesome behaviors going on with the foster children in their care. ← What do you want out of KFCA? ?